Review: David Ulansey, The Origins of the Mithraic Mysteries: Cosmology and Salvation in the Ancient World. Oxford University Press, 1989. This widely-read book is unusual among studies of ancient Mithraism, in that it is actually readable. The author states plainly his intention to be comprehensible even to non-specialists,1 and his reward has been that his book is still in print, twenty years on, and is perhaps the best known modern approach to the subject. It is not a general introduction to Mithraic studies. It concentrates solely on the question of what the mysteries were, and how they originated. One general issue that will strike the critical reader is that all footnotes are banished to the end. This is undoubtedly the responsibility of Oxford University Press, but is very unfortunate as it makes it difficult for the reader to verify them as he goes along. Ulansey unrolls his theory a little at a time. It seems appropriate, therefore, to review his book in the same way, chapter by chapter. The book grew out of a dissertation2. It begins with a few of pages of general introductory remarks, mostly unreferenced. But what do the monuments and inscriptions mean? Ulansey asserts (p.6) that the key to understanding the mysteries is to be found in the tauroctony, the standard image present in every Mithraic sanctuary in the central place. This is reasonable enough, but it is asserted, not argued. He continues that there are "obvious problems with Cumont's interpretation. 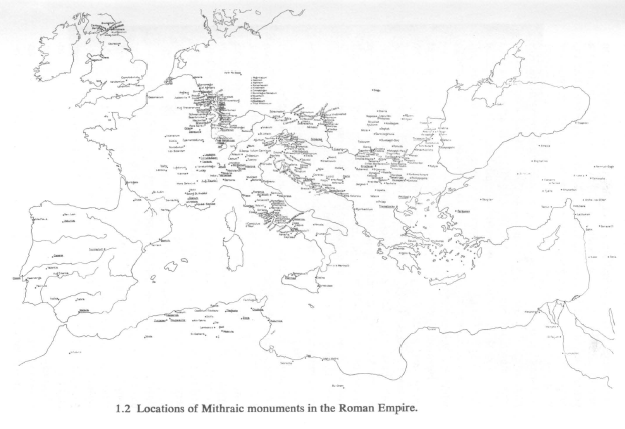 The Western mystery cult of Mithraism as it appeared in the Roman Empire derived its very identity from a number of characteristics which were completely absent from the Iranian worship of Mithra: a series of initiations into ever higher levels of the cult accompanied by strict secrecy about the cult's doctrines; the distinctive cavelike temples in which the cult's devotees met; and, most important, the iconography of the cult, in particular the tauroctony. None of these essential characteristics of Western Mithraism were to be found in the Iranian worship of Mithra." These deficiencies in the Cumont theory were raised forcefully at the 1971 Mithraic Studies conference. Papers by John R. Hinnells and R. L. Gordon addressed these issues, and Ulansey summarises them excellently. He finishes with an apt quotation from R. L. Gordon: "Cumont simply assumed at every critical point that the [Iranian] evidence was relevant, and proceeded to argue as though this were an established fact and not merely a working hypothesis." The aftermath of the conference left the field open for new ideas as to what the tauroctony meant, and how it came into being. These new ideas Ulansey deals with in the next chapter. It is unfortunate that the opening remarks refer to the mischievous remark of Renan equating "Mithraism" and Christianity and describe the two as "sister religions". This doubtless gladdens the heart of headbangers everywhere, but is a distraction from the real content of the book. This is, it seems, a Roman cult. In chapter 2 Ulansey moves onto the aftermath of the 1971 conference. Now that Cumont was no longer king, what next? If the tauroctony did not represent Iranian deities and the like, what did it represent, and where did it come from? Scholars turned to a theory advanced in 1869 by K. B. Stark. Stark noticed that many of the figures (Ulansey says "all") in the tauroctony -- the bull, scorpion, dog, snake, raven, lion and cup -- are to be found as constellations in the sky, which are all visible together at certain points of the year. This, he asserted, could not be coincidence. His ideas were rebutted by Cumont and ignored until 1971. Ulansey comments rightly that an astronomical aspect to the mysteries of Mithras had always been known. Many tauroctonies include the zodiac. Most include the sun and the moon; many include the seven planets; Mithras himself is depicted with stars in his cloak. The third century writer Porphyry commented in De antro nympharum 6 that the Mithraeum itself was intended as an image of the cosmos, and linked the sword of Mithras and the bull with the constellations. Origen in Contra Celsum also associates the planets and stars with Mithras. He then moves on to discuss events after the conference; a paper by Roger Beck in 1973 suggested that the figures represented the constellations in the sky at the time of the sowing of crops in autumn. Stanley Insler in 1977 proposes that it is the figures in the sky in mid-spring; and Alessandro Bausani in 1978 associates the collection with Sumerian astronomical ideas. All are described briefly with his customary clarity. The key problem that all the authors face is that there are other constellations in the same region of the sky at the same time, which do not appear in the tauroctony. If the tauroctony is intended as a star-map, that is plainly rather a problem. So each of the scholars spends time explaining why the "extra" constellations "do not count", and need not be considered. Secondly and perhaps even more importantly, neither Beck nor Insler asks an extremely obvious question which has probably already occurred to the reader: If all of the other tauroctony figures represent constellations which they resemble, shouldn't Mithras himself also represent a constellation to which he is similar in appearance? This self-evident question is never addressed by either Beck or Insler. It's a fair question, undoubtedly. Ulansey answers it "yes". But is it not entirely possible that the answer to this question is "no"? Various mythological figures have become constellations by the 1st century BC, for reasons that have nothing to do with Mithras. But it would be silly to argue, say, that a depiction of Pegasus on a wall must mean that the wall has cosmic significance. It may just be a portrait of Pegasus, arising naturally from Greek mythology. Ulansey does not address this question. Instead he treats the question as if it was an axiom. He then introduces the work of Michael Spiedel, who identifies Mithras with Orion. Spiedel suggests that the selection of constellations in the tauroctony is not simply that in a particular region of the sky at some point of the year. Instead he suggests that only the constellations that are over the equator at some specific time should be considered. At this point a reasonably critical reader will begin to feel distinctly uncomfortable. Methodologically all this seems perilously close to selecting the facts to fit the theory. If the facts do not support the theory, then new facts are sought instead. All this hypothesising is ingenious, but is it at all likely to produce anything that resembles the opinions of the cultists of Mithras in 100 AD? Again Ulansey does not ask this question, presuming that it can produce the truth, if only enough effort is invested. Nevertheless, in spite of the failures of their theories, there is clearly a wide area of agreement among these scholars concerning the basic astral nature of the tauroctony. Let us then adopt as a working hypothesis the hypothesis that all of these scholars have in common, namely, that the tauroctony is a star map representing the constellations Taurus, Canis Minor, Hydra, Crater, Corvus, Scorpius, Leo, and the star Spica. And let us begin our own exploration of the astronomical symbolism of the tauroctony by attemptmg to answer the obvious question which we have already posed several times (and which Speidel also tried to answer, albeit unsuccessfully): If all of the figures accompanying Mithras in the tauroctony represent constellations which they resemble, then shouldn't Mithras himself also represent a constellation? If the theories so far seem a little wild, the book has still usefully indicated a direction of research. Is it "often" represented thus? Ulansey has offered two examples only. This, surely, is over-statement. Likewise it seems strange to claim that Perseus being Persian "adds strength" to a hypothesis that Mithras = Perseus. The hypothesis is just now being made; this is part of the evidence being offered for it, no more. It's rather feeble evidence, surely? But he then goes on to something rather more interesting, based on literary sources. The earliest literary reference to Mithras is in Statius, ca. 80 AD, where the line contains the words "persei sub rupibus antri ..." and translates as "under the rocks of the Persian cave". Ulansey points out that "persei" is not actually the Latin adjective for Persian (Persicus, -a, -um) but rather means "Persean", from Perses, the son of Perseus and Andromeda, founder of the Persian nation in mythology. But "persei" could be the genetive of Perseus, and the words would therefore mean "under the rocks of the cave of Perseus". He then finds a detail in the 5th century commentator on Statius, Lactantius Placidus, where the latter, in a scholion on this line in a different ms. states "He gives to the rocks of a Persian cavern the name of temple of Perseus". Perseus, they say, brought to Persia initiation and magic, which by his secrets made the fire of the sky descend; with the aid of this art, he brought the celestial fire to the earth, and he had it preserved in a temple under the name of the sacred immortal fire; he chose virtuous men as ministers of a new cult, and established the Magi as the depositors and guardians of this fire which they were charged to protect. But unfortunately Ulansey has not obtained this direct from Cedrenus, but from some French book on the origin of cults. Does this amount to something? Well, not really. Certainly, if we knew that Mithras was the "outer name" for Perseus, this would be valuable confirmation of it. It would make sense of Plutarch's reference to Mithras being worshipped in Cilicia, where Perseus was popular. You can imagine, indeed, that the cultists would talk about their "Persean god", laughing at the mistake as they told people about Perseus and were only heard to say "Persian". It's all plausible. But there is nothing definite in this. Ulansey then (p.30) goes on to discuss why Mithras is portrayed as looking away from the bull as he kills it. He links this to Perseus killing the gorgon. But Perseus looks away as he kills the gorgon, because the latter could turn him to stone. The bull has no such power. The next section discusses whether the gorgon actually appears in Mithraea. He attempts to argue that the representations of the gorgon look somewhat like that of the leontocephalic deity found in some Mithraea, and sometimes labelled "Areimanios" (although Ulansey does not mention this latter point). But the argumentation is simply twisty. He winds up by acknowledging that the gorgon is female, whereas the figure of the leontocephaline god has a beard; and then asserts that this does not matter since each is depicted in a somewhat sexless manner (p.34). He finishes this section of the chapter with the words: "the similarity between the Gorgon and the leontocephalic god provides further evidence for the existence of a connection between Perseus, the slayer of the Gorgon, and the cult of Mithras." Does it? When he has to evade something as fundamental as the sexes of the two creatures? Mithras is worshipped in a cavern. Perseus was born to Danae, who was kept captive in one. Apparently this may form a "connection"? Ulansey speculates that Mithraists may have seen their underground temples as being like the interior of the rock from which Mithras was born. Well, so they may; but evidence of this there is none, and Ulansey doesn't try to offer any. His final piece of "parallelism" is that both Mithras and Perseus hold swords. Mithras uses a straight sword; but in one of the Ostia mosaics, which seem to depict various objects associated with the seven grades of initiate, a curved-bladed knife is shown against the seventh or highest grade, which is rather like the harpe associated with Perseus. Ulansey declines to reference the latter claim, but shows some pictures of vases. He finishes by referencing a claim by Cumont that the 5th grade of initiation, Perses, is also the name of the son of Perseus. The 7th grade is named Pater, or "Father". This would make the 5th grade perhaps "Son" or "child". Perhaps so. Indeed we could go further and mention the 6th grade, the heliodromus or sun-runner, which may be associated with Phaethon (depicted in some Mithraea), and so perhaps might be an intermediate step between child and adult. He finishes (p.39) with a flash of self-knowledge: that the parallels do not furnish evidence of a connection. But he then suggests that together with the astronomical speculation, this is "suggestive". What do we make of all this? Well, not much. Many things are "like" many other things. The problem is not in finding likenesses, but in excluding likeness where there is no connection. Some of what Ulansey says is interesting; but none of it is evidence. And without evidence, the idea that Mithras is a cover for a cult of Perseus remains just a hypothesis. The fact that there existed an important cult of Perseus in Cilicia, that is, in just that region which Plutarch says was the birthplace of Mithraism, clearly provides striking support for the hypothesis of a connection between Mithras and Perseus. It should be remembered that the argument connecting Mithras and Perseus has been based in the first instance on the new astronomical interpretation of the tauroctony, as a consequence of which the possibility arises that Mithras represents the constellation Perseus. It is thus remarkable that Plutarch's statements about the origins of Mithraism should lead us precisely to a locality in which Perseus was honored as a god. This convergence of evidence linking Mithras and Perseus is difficult to dismiss as mere coincidence. I believe, therefore, that I have demonstrated that the figure of Perseus played a role in the formation of Mithraism. Ulansey has taken the post-1971 hypotheses that the tauroctony is a star-map -- none of which work, as he has pointed out -- and found some interesting material about Persean / Persian in the literary sources, albeit of no particular force, and then says that, since Plutarch says Mithras was worshipped by Cilician pirates, clearly all this means that he has "demonstrated" that the figure of Perseus plays a role in the formation of Mithraism. Unfortunately he has not. He has heaped up three sets of hypotheses, none of them proven, and makes the classic error of supposing that lots of unproven hypotheses add up to a proof. This is the Von Daniken mistake, the technique of argument by piling up material which is never quite definitive. He finishes this rather woeful chapter by noting that Perseus is depicted on coins with Apollo, and makes a point about Apollo as a solar deity. Finally he refers to coins of Tarsus showing a lion attacking a bull. Ulansey has not finished with the astronomical stuff. He is, as he states, well aware of the problems of earlier writers. But he has a theory. In this chapter Ulansey's prose loses quite a bit of its clarity, unfortunately. He points out some Mithraic statues where the lion-headed god stands on a globe with two bands intersecting on it. These, he suggests, are the celestial equator and the ecliptic. And he points out that the celestial equator is not always in the same place. Over time it wobbles, because the earth wobbles. The north star does not always point to Polaris, for instance. The earth wobbles around a circle, as the centuries pass. This is known as the "precession of the equinoxes". Because of this, Ulansey suggests that the tauroctony does not represent all those constellations which are on the celestial equator now; but rather those which were on it between 4000-2000 BC. At that time Taurus and Scorpio were on the equator. He then adds: "Of course, in arguing this claim I will need to provide an explanation as to how a religious movement from the time of the Roman Empire came to know about and to incorporate the position of the celestial equator as it was several thousand years earlier. " But he leaves this to one side, and instead goes into further details necessary to make the new picture fit. Ulansey, then, recognises that on the face of it his explanation is absurd. But he believes that he can find some kind of explanation, some kind of factoids or theory. Again it all feels uncomfortably like bending the facts to fit the theory. What, we might ask, compels us to jump through all these hoops? Would it not be simpler to say "the tauroctony is not a star-map"? It surely would. Ulansey then turns to the position of Mithras-Perseus in his new sky. Unfortunately Perseus isn't in the "right" place. But again he offers some suggestions that would "move" some crucial bits of the constellation. He adds: "Thus, although we have no positive proof of the fact, it is likely that the Taurus-equinox celestial equator passed through the constellation Perseus as it was imagined in Cilicia at the time of the origins of Mithraism." As he acknowledges, he has no proof of any of this. But what about Cautes and Cautopates, the attendants of Mithras and, surely, some of the most significant figures in the tauroctony? They carry a bull's head and a scorpion, they can be associated with Taurus and Scorpio. That would seem to give us two figures for those constellations. But Ulansey is sure that these chaps are not constellations, but instead represent the equinoxes, one depicted with a tree in flower and the other with a tree in fruit. Once again, the critical reader will look in vain for positive evidence rather than speculation. This chapter is the worst so far. There is not the slightest likelihood that a cult that came into being ca. 50 AD -- or 100 BC, if we follow his suggestions -- makes use of a star-map representing any form of the sky other than the one over their heads. The involuted hypotheses used to support any other view seem self-refuting. This is the chapter in which Ulansey deals with the question of how anyone would know what the heavens looked like 2000 years earlier. He asserts that Tarsus had a Greek philosophical community, and devotes some space to evidence of this, which we may accept. He mentions Aratus of Soli, 315-240 BC, only 20 miles away. He then suggests that it is the consensus of scholarship that the precession of the equinoxes was discovered by Hipparchus ca. 128 BC. Unfortunately his footnote for this claim does not give evidence for it, but instead discusses a side-issue. However he tells us (p.76) that Ptolemy in the Almagest states that Hipparchus made this discovery by comparing his observations of the stars with observations by the earlier astronomer Timocharis (Alm. 7.1-2). From this Ulansey argues that it was perfectly possible for the Greeks of Tarsus to work out the position of the stars at earlier periods. There are several rather dull pages of material about Hipparchus that follow. There is nothing outrageous in all this. It should have been possible for the Greeks to do these kinds of calculations. No doubt they could. But did they? Do we have actual evidence that they did? On this question Ulansey remains stubbornly silent. The remainder of the chapter consists of further speculation of the same kind, and has no particular interest to us. The first six chapters have all been about the tauroctony, and how its meaning shows where the cult originated; in Cilicia, some time after Hipparchus. Chapter seven addresses some other bits of Mithraic symbolism. In particular Ulansey tries to demonstate that Mithras was seen as kosmokrator, ruler of the universe. The chapter seems rather like padding, in truth. The Mithraic mysteries ended as a religion of soldiers, based on an ideology of power and hierarchy. But if my arguments are valid, then the Mithraic mysteries began as the response by a group of imaginative intellectuals to the unsettling discovery that the universe was not quite as simple as they had thought it to be. Perhaps so. But it is not enough to imagine something. It must arise naturally from the data. There are various terms that might be used of Ulansey's theory, but few would call it a natural development from the literary and archaeological remains of the cult of Mithras. Let us summarise what Ulansey has to say. The origins of the cult of Mithras can be discovered from a correct analysis of the tauroctony images. These are star maps of the period before 2000 BC. The star maps were drawn up in Cilicia by Stoic philosophers, some time after 128 BC and before 68 BC. The mysteries consisted of explaining how Mithras was the god in control of the world, at least as it looked in 2000 BC, before the skies changed into something like the current arrangement. Well, it's all possible. Ulansey definitely makes a good case. His theory that Mithras is really Perseus in disguise is very interesting, and it could be so. But the problem is that there seems to be no pressing reason actually to believe any of this. Surely it is simpler -- requires fewer hypotheses -- for us to believe in a wandering god-maker -- Merkelbach's "religious genius" -- who created a novel hellenistic mystery religion and mixed in some oriental/Persian names to give his new god a suitably exotic name and provenance? The pseudo-Zoroaster literature is witness to the sort of thing that went on. Do we need to look further? 1. Ulansey, p.ix: "The subject matter is complex, but in writing this book I have attempted always to keep the nonspecialist reader in mind. It is my hope that even the technical astronomy and classical minutiae involved in the discussion have been handled in such a way as to be intelligible to the general reader."